On October 7, Tran Thi Xuan’s family visited her and noted that her health was not good because of her beriberi (a lack of vitamin B1/thiamin), but she was in good spirits. She told her family to not worry about her because she could deal with every trouble in prison. Her family started to send her medicine after the meeting, but they are not sure if she will receive it. Tran Thi Xuan resided in Long Hai hamlet, Thach Kim commune, Loc Ha district, Ha Tinh province. She is a member of Cua Sot parrish, Loc Ha district. Tran Thi Xuan was active in her Catholic community, raising money for charitable causes. She also spoke out against pollution in the wake of the 2016 Formosa environmental disaster and participated in protests in Loc Ha districts to demand compensation for the fishermen for the pollution caused by the toxic spill. Arrested October 17, 2017. Sentenced to 9 years in prison under Art. 79 (1999 Code). Expected Release is October 17, 2026. Tran Thi Xuan was arrested under Article 79 (“attempt to overthrow the people’s government”) by the police of Ha Tinh province in Ha Tinh province on October 17, when she was on the way from her home to the local church. Her family was not notified about the arrest until the following day, and they were only informed by phone. 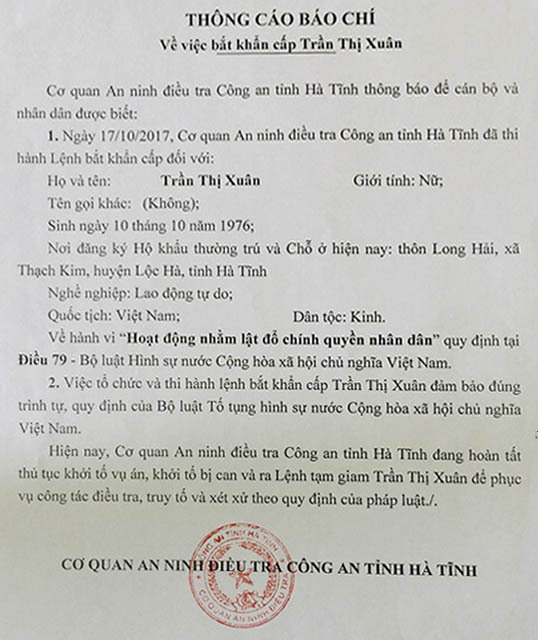 There was no arrest warrant, and the police of Ha Tinh province only issued a "Press release on the urgent arrest of Tran Thi Xuan" two days after the arrest. The authorities were not clear about the details of the charges against her. Hundreds, and perhaps a few thousand, people protested Xuan’s arrest in a mass public display of support in Ha Tinh. Supporters also held a prayer vigil in her honor. 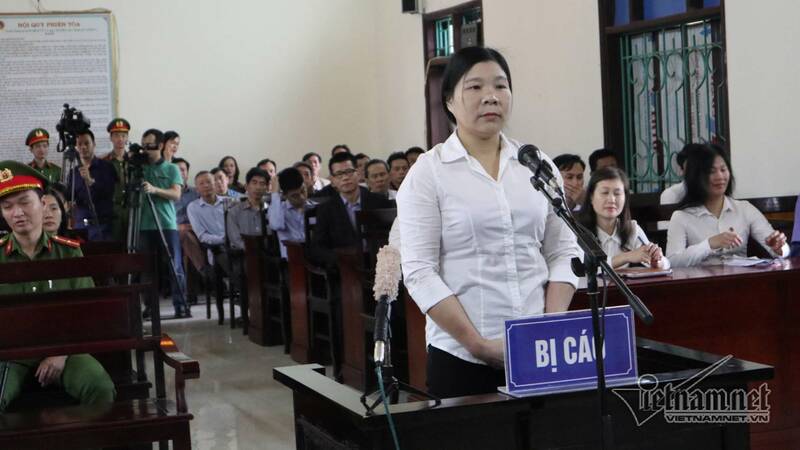 On April 12, 2018, Tran Thi Xuan was sentenced to nine years in prison by a court in Ha Tinh province. Her trial was unannounced to the public beforehand. She had to face trial without an attorney. Human Rights Foundation submitted an individual complaint to the UN Working Group on Arbitrary Detention regarding the case of Tran Thi Xuan. Read the full complaint, here. Continuing a string of recent prison transfers, authorities moved female activist and political prisoner Tran Thi Xuan from the Ha Tinh province police detention center to prison no. 5, Thanh Hoa province. Before arrest: Xuan suffered from multiple health problems, including kidney disease and asthma. After arrest: the picture from her trial shows that Xuan may be suffering from fluid retention due the lack of treatment for her kidney disease. Catholic parishoners and priests have asked the Vietnamese government to reconsider the conviction of Tran Thi Xuan. In a petition submitted the government, they alleged that Xuan has been denied visits from both family and lawyers while imprisoned. They questioned the motives behind Xuan's arrest and whether they were connected to Xuan's assistance towards victims of the Formosa ecological disaster. Nguyen Thi Lanh, Nguyen Trung Ton's wife, and other relatives of imprisoned activists met with US Embassy representatives in Hanoi to raise concerns about the health and treatment of Ton, and fellow imprisoned Brotherhood for Democracy members Truong Minh Duc, Tran Thi Xuan, and Pham Van Troi, in prison. Xuan has had health problems while imprisoned.